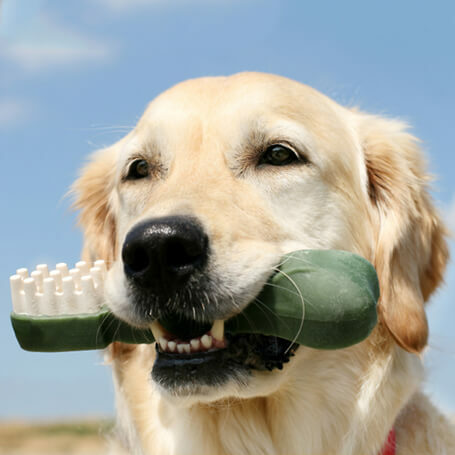 Good dental care and hygiene are essential for the overall health and comfort of your pet. Infected teeth and inflamed gums (gingivitis and periodontal disease) can be a chronic source of pain for both cats and dogs and can affect their ability to play and interact with you on a daily basis. We provide state-of-the-art dental care for your pet, including scaling and tooth extractions, if needed. The most effective way to help prevent periodontal disease in both cats and dogs is brushing their teeth daily. Starting them young (as puppies and kittens) by using a finger brush will gradually allow your pet to become comfortable having their teeth brushed. It is important to use a pet-specific toothpaste to avoid ingestion of fluoride found in human toothpaste. Buena Vet stresses the importance of dental care. Don’t wait until dental month (February) to schedule your evaluation, and please contact us even if you haven’t received a recommendation. We are pleased to offer a year-long dental program, which includes $50 off a dental package if booked within 30 days of your veterinarian recommending dental work. This evaluation includes a treatment plan for the procedure. Additionally, we do blood work at the same time to make sure your pet can safely go under anesthesia.